Grant helps Marietta Volunteer Fire Department purchase a 2018 large brush truck. 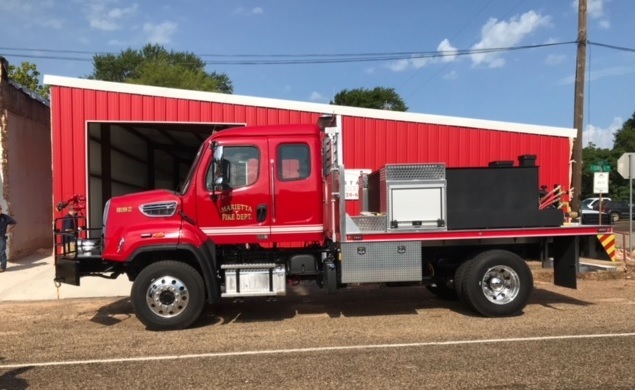 MARIETTA, Texas  Marietta Volunteer Fire Department accepted a cost-share grant through the Texas A&M Forest Service Rural Volunteer Fire Department Assistance Program. The grant was used to help purchase a brush truck with all-wheel drive, a 750-gallon poly water tank, and a 20-gallon foam cell. According to Ham, the truck will be a great benefit when responding to wildland, structure, farming and pine plantation fires and vehicle accidents. The volunteers will be taking a class to become familiar with the operation of the truck before it is used to respond to a call. The department had several fundraisers to help pay for the cost share portion and wish to thank the community for their support. “The truck is housed at the Marietta Fire Station if anyone would like to come by and see what they helped purchase,” said Ham. Marietta Volunteer Fire Department was established in 1972. The 12 committed volunteers serve and protect their community and assist in mutual aid with surrounding departments. 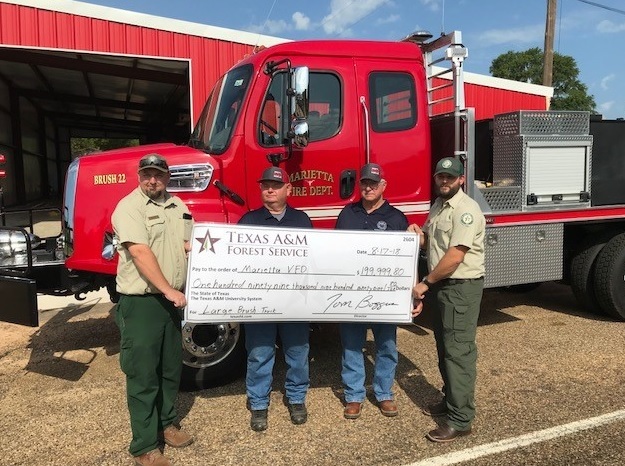 Texas A&M Forest Service is committed to protecting lives and property through the Rural Volunteer Fire Department Assistance Program, a cost-share program funded by Texas State Legislature and administered by Texas A&M Forest Service. This program provides funding to rural Volunteer Fire Departments for the acquisition of firefighting vehicles, fire and rescue equipment, protective clothing, dry-hydrants, computer systems and firefighter training. For more information on programs offered by Texas A&M Forest Service, please visit http://texasfd.com.